The word ‘predator’ conjures up the image of a powerful stalking lion, stealthy leopard or lightning fast cheetah. However, the world of predators is far greater and more diverse than this and refers to any creature that feeds on live prey. Guests at Sabi Sabi – particularly those new to the bush – often express their wish to ‘see a kill’, only to soon ask to be removed from the sighting if they’re lucky enough to witness one. The sheer brutality of the attack, the clinical killing and often pathetic sounds from the prey can be overwhelming. 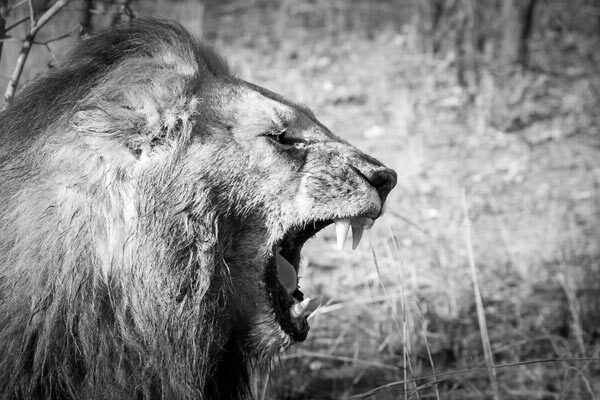 Andre van Zyl, Safari Manager at Sabi Sabi, has written a fascinating account of the role predators play in the environment. Predators can and should be considered the ultimate habitat managers. Take, for instance, the role that crocodiles play in aquatic environmental management. They may not be the most wanted viewing animal, but they are at the top of the pile in freshwater habitats. Mosquitos breed in water and in a natural ecosystem mosquito larvae are preyed on by fish such as barbs and tilapia. In turn the barbs and tilapia are eaten by catfish thus keeping their numbers in check. The staple diet of small to medium sized crocodiles is catfish. Thus, through an ‘eat and be eaten’ chain, populations of mosquito larvae, barbs, tilapia and catfish are kept in equilibrium. 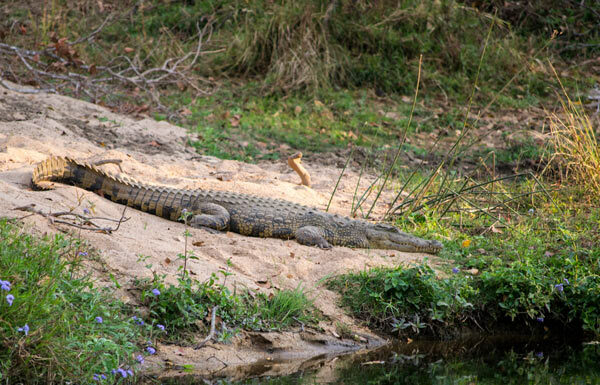 You may wonder what is keeping the crocodile population under control. Nature’s management skills of course! In the wild the mortality rate of young crocodiles is extremely high as storks, ground hornbills, monitor lizards and even fish eagles consume the eggs and young crocodiles – so, the population is kept in check. If however we were to remove the apex predator, i.e the crocodile, from this fresh water ecosystem what would happen? In short, a ripple effect of considerable magnitude. Without crocodiles the catfish population would explode, which in turn would decimate the tilapia and barb populations. Due to the subsequent dearth of mosquito larvae predators a massive rise in the numbers of mosquitoes would ensue. If it were a malaria area this could potentially cause a rampant increase in the number of cases of malaria. So, although not immediately apparent, crocodiles help control malaria! A second example is lions and the role that they play in controlling the numbers of prey species but also, as importantly, their impact on the flora and fauna in an area. The Cape Buffalo is incredibly important in terms of grass utilisation. The “dagga boys” (old buffalo bulls) feed on shade-dwelling grasses that are rich in protein and located in riverine areas with very fertile soils. In the evening however these old bulls move to the crests of the valley where it is warmer and more open. The breeding herds of buffalo on the other hand forsake the riverine grass quality for safety remaining in open areas which, although offering lower quality graze, afford better visibility and they are thus safer. Owing to their low nutritive value these grasses would not normally be consumed by other grazers (i.e. impala, zebra, wildebeest, etc.) Thus if it were not for the buffalo herds these poor quality grasses would ultimately suffocate as explained previously. Breeding herds of buffalo in areas with poor quality grasses are hence crucial for ecosystem functioning and nutrient recycling. Buffalo weigh approximately 600 – 800kgs and have hard cloven hooves which are perfect for cracking and ripping soils. Also due to the structure of their digestive systems they are almost continuously defecating, churning this manure into the soil by the action of their hooves. Buffalo are in other words mobile ploughs and fertiliser dispensers! Enter the lions. In the Sabi Sabi area buffalo are probably the most important food source for our lion population. Lions tend to follow the buffalo herds forcing them to move constantly. 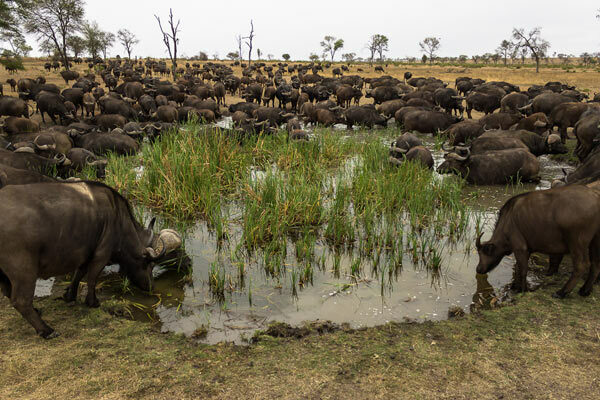 This movement of the buffalo herds allows the unpalatable grasses to be utilised in multiple locations but also allows the grasses time to regenerate when the herd moves on. Again, as in the case of the crocodiles, although not immediately apparent, an apex predator is maintaining the health of the ecosystem. So, next time you view the reptilian poise of a crocodile or the feline grace of a lion or leopard, spare a thought not only for their elegance and photogenic appearances but also for the crucial role they play in ecosystem management.